Join us to welcome knit designer extraordinaire Andrea Mowry in our shop for a happy hour to celebrate her Trunk Show at Spun. As almost anyone reading this already knows, Andrea has been winning raves for her design work for a number of years, and she is bringing over 20 of her best-loved sweaters, shawls, and hats to our shop for a week-long display. Take the chance to meet this celebrated designer at our happy hour, and enjoy drinks, treats, and a door prize drawing. 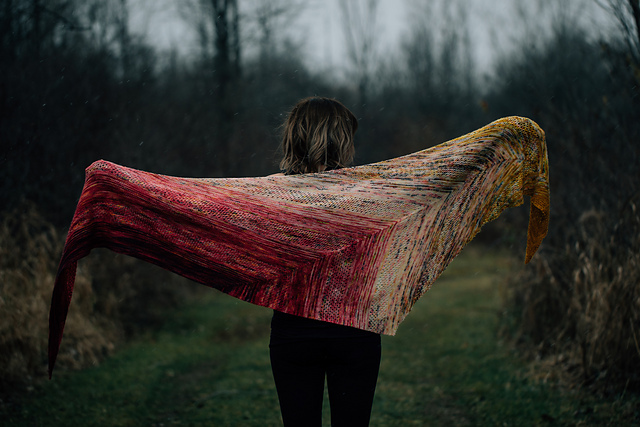 Get inspired by her designs, and get ready to knit one (or more!) for yourself. And, stay tuned for news about upcoming classes that Andrea is teaching in the shop. Andrea is one of the many who was lucky enough to learn how to knit as a child from her grandma. By her late teens, guided by the wisdom of the great Elizabeth Zimmerman and her many books, she began trying to work out her own patterns. After leaving her life as a pastry chef to start a family with her husband, her hands found the necessary freedom to begin creating with fiber instead of flour. She focuses on designing knits to fit the modern wardrobe – fun to knit and easy to wear, with clear directions for every level of knitter. She believes in enjoying every stitch and wearing at least one hand knit everyday! Andrea has a great love for indulging in new techniques and skills and then sharing them with other knitters thru her patterns and workshops. Her goal is to leave knitters feeling empowered and inspired, and wrapped up in their own beautiful knits!